Four extreme cold air outbreaks in recent history have been analyzed in order to determine if there were similar atmospheric signals in the weeks prior to these events. The four extreme cold air outbreaks examined here include the most recent one that took place across parts of Canada and much of the eastern half of the US during late January 2019 (Figure 1). This analysis shows that there were strikingly similar characteristics in all four of the extreme cold air outbreaks with the roots of each traced to the tropics and to the upper part of the atmosphere known as the stratosphere. In all four cases, a recurring tropical disturbance known as the Madden-Julian Oscillation (MJO) contributed to a major stratospheric warming event which ultimately led to the extreme cold air outbreaks into the middle latitudes. 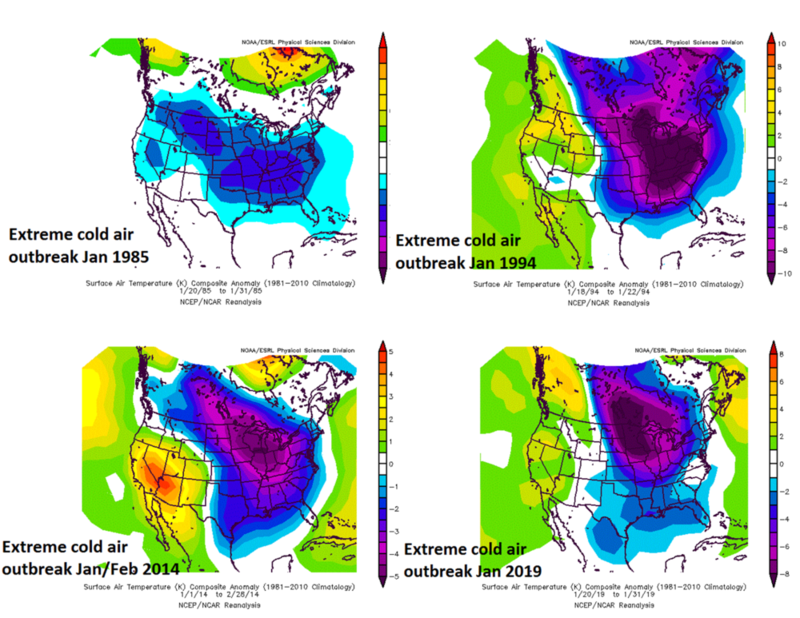 Figure 2: Surface temperature anomalies are shown for each of the four extreme cold air outbreaks used in this study which took place in January 1985 (upper left), January 1994 (upper right), January/February 2014 (lower left) and January 2019 (lower right). Maps courtesy NOAA/ESRL. Four extreme cold air outbreaks (Figure 2) in recent history have been examined for this analysis. The most recent cold air outbreak of late January 2019 resulted in dozens and dozens of daily low temperature records across Canada and the US as well as many monthly records and even several all-time low temperature records. One example of a monthly low temperature record took place in Milwaukee, Wisconsin (KMWC) on January 30th when the temperature bottomed out at -22°F. Examples of all-time low temperature records that were set during this latest extreme cold period include the following: -49°F at Chapleau Ontario Canada (January 28), -33°F at Moline, Illinois (January 31), -29°F at Rockford, Illinois (January 31) and -35°F at Volk, Wisconsin (January 31). In addition, an all-time low temperature record for the state of Illinois was apparently set (still unofficial) on January 31st as the coop site at Mt. Carroll reported a low temperature of -38°F. The pervious all-time record low for the state of Illinois was -36°F set in Congerville on January 5, 1999. The state of Minnesota came very close to their all-time low temperature record with a low of -56°F in Cotton which fell 4 degrees short of matching the state record of -60°F set in 1996. One final note, Chicago, Illinois came within three degrees of matching its all-time record low when temperatures bottomed out at -24°F on January 30th. The old (and still-standing) all-time record low at Chicago was -27°F set on January 20, 1985 during one of the four extreme cold air outbreaks used in this analysis. The extreme cold air outbreak of January 1985 has become commonly referred to as the “Ronald Reagan Inauguration Day Outbreak”. As of result of the extreme cold on January 20th in 1985 in Washington, DC where temperatures were not far from zero degrees, all outdoor activities for the second inauguration of Ronald Reagan were cancelled in order to protect the public from the extreme cold. A third extreme cold air outbreak used in this analysis took place in January 2014 and it actually extended into the month of February of that particular winter season. This particular winter season and its extreme cold air outbreaks are commonly tied in with the “polar vortex” as this is when it became popularized by the media. Finally, a fourth extreme cold air event took place in Canada and the US during January 1994. This particular month is well remembered in the Mid-Atlantic region for its numerous ice storms; especially, in places along the I-95 corridor (e.g., Philly metro region). In addition to numerous ice storms during January 1994, there was an extremely cold air outbreak which brought temperatures to as low as 10 degrees below zero in suburban locations to the north and west of Philly. The Madden-Julian Oscillation (MJO) is a tropical disturbance that propagates eastward around the global tropics with a cycle on the order of 30-60 days; hence, it is commonly referred to as the 30-60 day oscillation. It is a large-scale coupling between atmospheric circulation and tropical deep convection. Rather than being a standing pattern (like “El Niño/Southern Oscillation”) it is a traveling pattern propagating eastwards at approximately 4 to 8 meters/second, through the atmosphere above the warm parts of the Indian and Pacific oceans. The MJO is characterized by an eastward progression of large regions of both enhanced and suppressed tropical rainfall, observed mainly over the Indian Ocean and the Pacific Ocean. The anomalous rainfall is usually first evident over the western Indian Ocean, and remains evident as it propagates over the very warm ocean waters of the western and central tropical Pacific. Research has found that the location of the MJO or its “phase” is linked with certain temperature and precipitation patterns around the world. Figure 3 illustrates the 90-day progression of the MJO through different phases during these four extreme cold air outbreaks which generally coincides with locations along the equator around the globe. When the index is within the center circle, the MJO is considered weak, meaning it is difficult to discern. Outside of this circle, the index is stronger and will usually move in a counter-clockwise direction as the MJO moves from west-to-east. Research has also found a connection between the MJO and the stratosphere. In recent publications (Garfinkel, et al, 2012; Wheeler and Hendon, 2004), it was found that about ten days after the MJO passes its phase with enhanced convection over the Indian Ocean, warm anomalies are established in the polar lower stratosphere. Specifically, a strong connection has been shown to exist between the MJO and the Northern Hemisphere wintertime stratospheric polar vortex. Sudden stratospheric Warming (SSW) events in the reanalysis record tend to follow certain MJO phases, likely because the MJO influences the region in the North Pacific most strongly associated with tropospheric planetary wave driving. In each of these four extreme cold air outbreaks, one striking similar characteristic is the propagation of the MJO through phases 3 and 4 in the month of December - just weeks prior to the Arctic blasts. During the month of December, phases 3 and 4 of the MJO typically result in enhanced convection over the Indian Ocean. One parameter that provides information regarding convection is known as the outgoing longwave radiation or OLR which can be used as a way to identify tall, thick, convective rain clouds. Figure 4 shows the difference from expected cloudiness based on the position or phase of the MJO where the violet and blue shading indicates higher than normal, active or enhanced tropical weather and orange shading indicates lower than normal cloud or suppressed conditions. Figure 5: Major stratospheric warming took place in the weeks just prior to the four extreme cold air outbreaks used in this analysis. 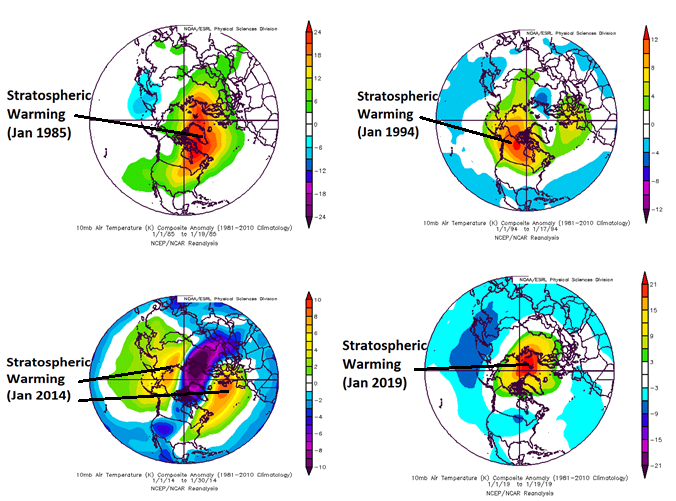 Stratospheric temperature anomalies at 10 millibars are shown in January 1985 (upper left), January 1994 (upper right), January/February 2014 (lower left) and January 2019 (lower right). Data courtesy NOAA/ESRL. During the winter months in the lower polar stratosphere, temperatures on average are below minus 70 degrees Celsius. The cold temperatures are combined with strong westerly winds that form the southern boundary of the stratospheric polar vortex. The polar vortex plays a major role in determining how much Arctic air spills southward toward the mid-latitudes. Major sudden stratospheric warming (SSW) events occur in the Arctic stratosphere at a frequency of about six events per decade and involve a disruption or even a reversal of the stratospheric vortex, accompanied by a steep rise of the polar cap temperature. Under these circumstances, the temperatures in the lower stratosphere can rise by more than 50 degrees in just a few days. This sets off a reversal in the west-to-east winds and the collapse of the polar vortex. In response to the stratospheric warming (expansion) at the high latitudes, the troposphere in turn cools down (contracts) dramatically and this cold air displacement is then transported from the tropospheric high latitudes to the middle latitudes. Figure 6: Spikes in stratospheric temperatures at 10 millibars (indicated by arrows) are shown for each of the extreme cold air outbreaks [January 1985 (upper left), January 1994 (upper right), January/February 2014 (lower left) and January 2019 (lower right)]. Maps courtesy NOAA/CPC. One of the impacts of enhanced convection in the Indian Ocean region during the winter season when the MJO propagates through phases 3 and 4 is the warming of the stratosphere on the Asian side of the North Pole. The stratospheric warming then typically propagates to the polar region which sets off a chain of events in the atmosphere leading to the displacement of extreme cold air from the high latitudes to the middle latitudes (e.g., into Canada and the US) in subsequent weeks. In fact, a strikingly similar characteristic of each of these four extreme cold air events was a sudden stratospheric warming event. Figure 5 displays the stratospheric (10 mb) temperature anomalies during January in each of these four winter seasons just prior to the Arctic air outbreaks. In three of the four cases, the stratospheric warming was centered over the polar region and onto the North America side of the pole while the fourth (January 1994) featured split areas of anomalous stratospheric warming on both sides of the North Pole. 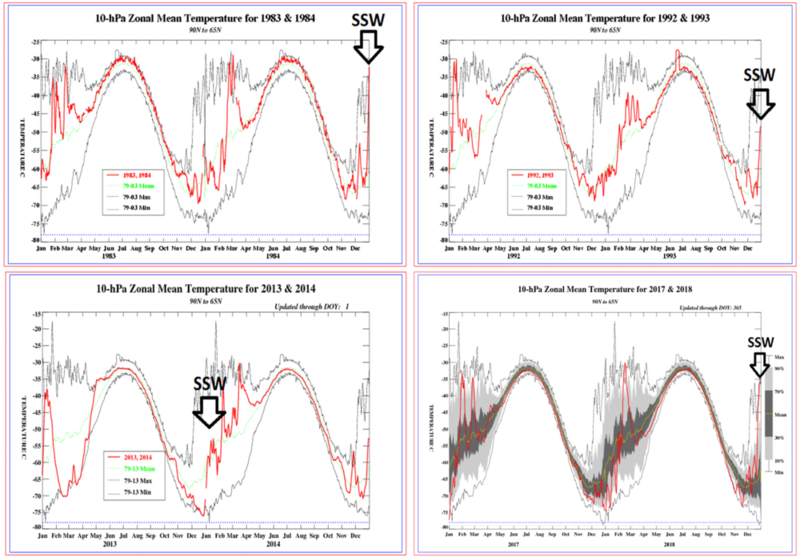 Figure 6 shows a sudden spike in polar region stratospheric (10 mb) temperatures (indicated by arrows) just prior to the four extreme cold air outbreaks used in this analysis. in all four of these particular extreme cold air outbreaks. In all four cases, the stratospheric warming event takes several weeks to unfold from the time the initial warming took place on the Asian side of the North Pole to the time the extreme cold air was displaced from the high latitudes to the middle latitudes. Four extreme cold air outbreaks in recent history have been analyzed in order to determine if there were similar atmospheric signals in the weeks prior to the events. The four extreme cold air outbreaks examined here include the most recent one that took place in late January as well as those which occurred in January/February 2014, January 1994 and January 1985. In all four cases, the roots of the extreme cold air outbreaks were traced to the tropics and to the upper part of the atmosphere known as the stratosphere. The general sequence of events was for the tropical disturbance known as the Madden-Julian Oscillation or MJO to propagate through phases 3 and 4 during the month of December and just prior to the extreme cold air outbreaks. These particular phases of the MJO resulted in enhanced convection over the Indian Ocean which, in turn, led to stratospheric warming on the Asian side of the pole. The stratospheric warming then propagated to the polar region setting off a chain of events which ultimately led to the extreme cold air outbreaks into the US and Canada several weeks later. One final note, an important factor with respect to surface temperature anomalies in the US during these extreme cold air outbreaks that was not included as part of this analysis is the ice cover extent on the Great Lakes. As cold air crosses over the relatively warm waters of the Great Lakes in the wintertime, there typically is some modification in the extreme cold and the level of that modification is determined in large part by the scale of the ice coverage.